Constraints can be fun, for they remove the paralysis of the blank slate, and call forth creativity and invention. This project certainly had both in spades; for one, it’s a renovation (and perhaps adaptive reuse?) 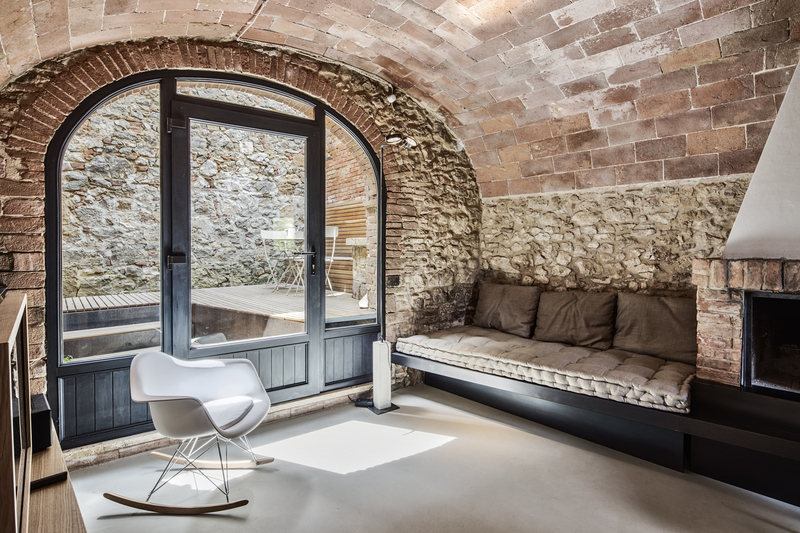 of a lovely and quirky stone building in an Italian hillside town, and for two, it’s absolutely tiny. And it’s an apartment. Here’s what the existing conditions brought: a lofty space made of richly textured walls that constrict the further in you go thanks to walls not aligning. It also brought a floor level that was several steps below the equally small entry yard. Into that context, the renovation begins with an elevated deck and fire pit in the entry space, coupled with extended brick and rusted steel walls to create a private courtyard. Inside, though, is a tonne of very cool additions and installations. Most noticeably is the barrel vault that creates the second floor. 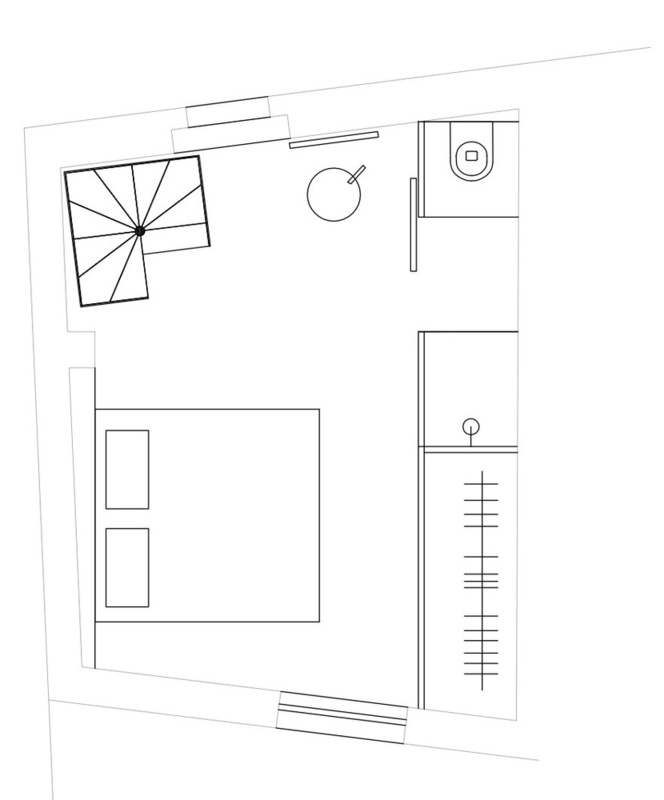 Much more than a flat ceiling would be, it maintains a sense of height (in what is not exactly a very high room) while also splitting the ground floor into different zones without walls or encroaching on the limited floor space. Adding to this feel are the bits of built-in furniture and cabinets, especially the sofa/mantlepiece/fireplace that extends to accentuate the angular shape of the room. 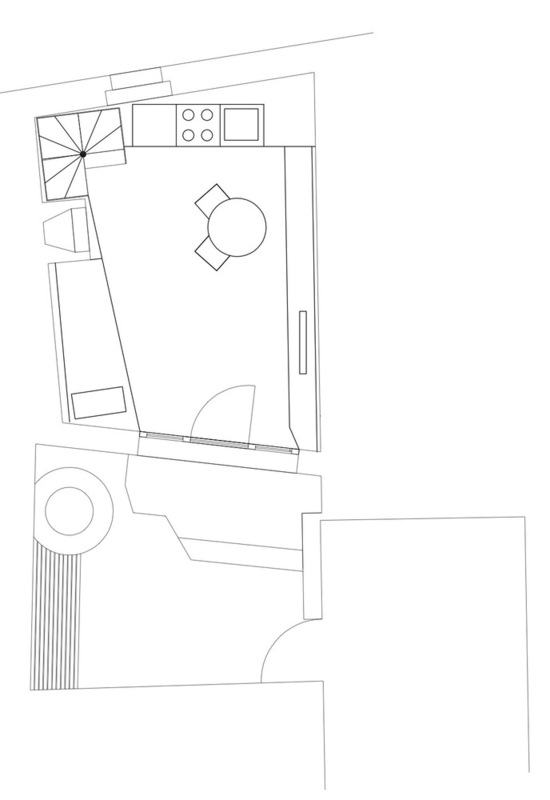 Up the spiral staircase, a thickened closet becomes a restroom and shower, while on the opposite, angled, wall, the headboard grows in thickness to follow the closet and create depth between itself and the angled wall. Nicest of all is the freestanding sink and mirror, a statuesque object next to the window (itself with a sweet thick steel plate sill) overlooking the mountains beyond. My only quibble would be with the exposed wiring, not for its exposedness, but for its seeming lack of care. 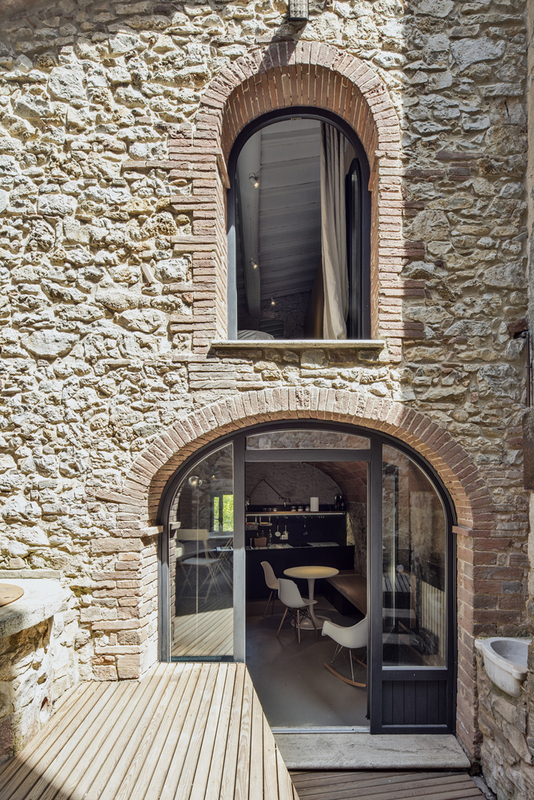 In a space where there is a lot of play between the beautiful existing stone and the slickly crafted additions, the wiring occupies an awkward middle ground. A very nicely done project, fully using the great character of the oddly shaped existing space and adding just what’s needed to make a beautiful abode.